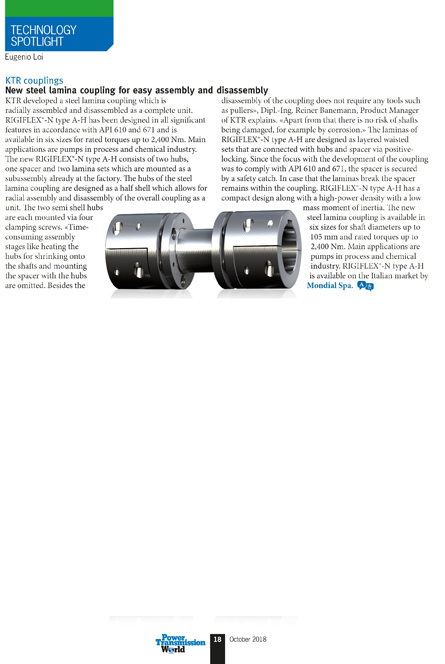 KTR developed a steel lamina coupling which is radially assembled and disassembled as a complete unit. RIGIFLEX®-N type A-H has been designed in all significant features in accordance with API 610 and 671 and is available in six sizes for rated torques up to 2,400 Nm. Main applications are pumps in process and chemical industry. The new RIGIFLEX®-N type A-H consists of two hubs, one spacer and two lamina sets which are mounted as a subassembly already at the factory. The hubs of the steel lamina coupling are designed as a half shell which allows for radial assembly and disassembly of the overall coupling as a unit. The two semi shell hubs are each mounted via four clamping screws. spacer is secured by a safety catch. In case that the laminas break the spacer remains within the coupling. RIGIFLEX®-N type A-H has a compact design along with a high-power density with a low mass moment of inertia. The new steel lamina coupling is available in six sizes for shaft diameters up to 105 mm and rated torques up to 2,400 Nm. Main applications are pumps in process and chemical industry. RIGIFLEX is available on theItalian market by Mondial S.p.A.